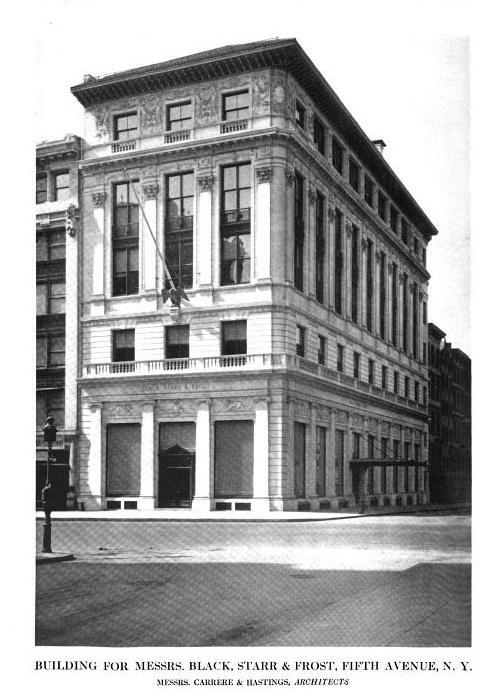 The Black, Starr & Frost Building designed by Carrere & Hastings c. 1912 at 592 Fifth Avenue (and 48th Street) in New York City. Black, Starr & Frost, jewelers, erected their new headquarters on the site of the former C.T. Cook residence, click HERE for more. The building underwent significant alterations in 1964. 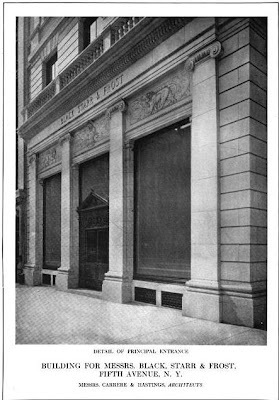 Photos from The American Architect, 1912. The street level is superb--the quality of the pilasters, the frieze above the windows---control and proportion, a sure eye for detail. I can understand adding the extra floors in the early 1960s, but what a shame to lose the wonderfully proportioned detailing of this building, a great example of scale.